American Authors, comprised of Zac Barnett (vocals), James Adam Shelley (guitar/banjo), Dave Rublin (bass), and Matt Sanchez (drums), came together in 2006 at Boston’s Berklee College of Music. They quickly dropped out, moved to Brooklyn and formed a band. 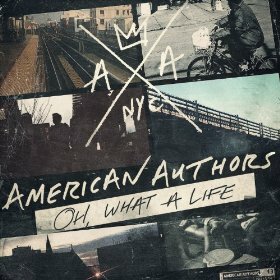 Oh, What a Life is an upbeat pop album with plenty of foot-stomping, hand-clapping songs. The tracks are catchy, but fairly generic and I feel like I’ve heard the whole album before. With that being said, some songs include depth without the dark moody vibe we’ve come to expect from meaningful songs. The opening track, “Believer,” draws the listener right in with its cheerful tempo and lyrics that are bound to get stuck in your head. “Best Day of My Life” can be heard everywhere right now from car commercials to my yoga class. It deserves the heavy exposure; it’s the best song on the album and the one that may leave the band a one-hit wonder. “Luck” shows a deeper, more intense side of the band and may be a hit just on that basis alone. The band infuses a little folk/country into “Trouble,” showing a broader range of their sound. The album closes with “Oh, What a Life,” a sentimental song that lacks real seriousness, but rather the emotions that come out after a day of drinking. Overall, the album is fun and full of songs to sing along to, even if it is at the local pub. American Authors has some real potential; they played it a bit safe for their debut, which is OK for a pop album. They did show enough range to prove they might have some real staying power, so we’ll see if they take a bigger leap on their next album.